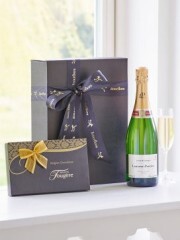 Laurent-Perrier has created unique and elegant Champagnes for nearly two hundred years, so what better gift to open on a special celebration than this presentation box containing a bottle of Laurent-Perrier's esteemed Brut Champagne? 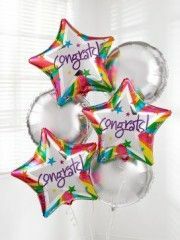 Congratulate someone with a surprise delivery of six helium-filled balloons.Our Congratulations Balloon Bouquet includes three bright blue balloons and three 'Congrats' balloons - a gift they're sure to love! 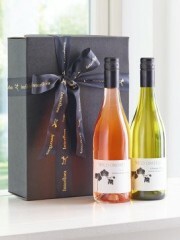 This beautifully presented duo includes a traditional partnership of red and white wines, chosen for their depth of flavour and easy drinking qualities. Both from the sunny vineyards of South Africa, the mix of full-bodied, smooth red and crisp, fresh white means there’s something for every palate. This ultra-feminine presentation bouquet in sumptuous shades of pink and purple includes a generous selection of heavenly fresh flowers. The complementary hues give depth to the design. It’s sure to look stunning when it is presented, and will look beautiful wherever it is displayed. 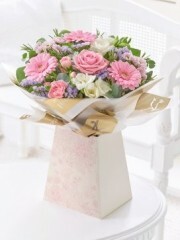 For grace and sophistication without being overstated, choose this classic presentation bouquet. 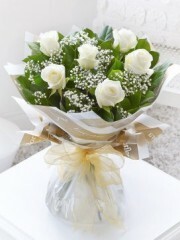 We’ve chosen a selection of beautiful fresh flowers in pristine cream and white. They look enchanting set against lush green foliage and are sure to create a big impact. This exquisite presentation bouquet is the ultimate in dramatic impact. 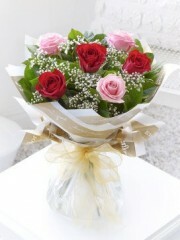 We’ve chosen large headed roses in a ruby red shade as the stars of the arrangement. The creamy white and rich purple flowers add to the overall effect. This entire selection is a show-stopper. 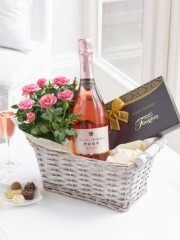 Stonehaven flowers have a great range of celebration flowers and gifts. From a hand tied bouquet to a bottle of Champagne at Stonehaven florist we have everything you could want to send to celebrate with someone on a special occasion such as an engagement, some good news, a new house or another exciting occasion. 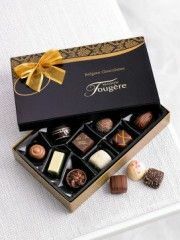 Gorgeous flowers, stylish plants and luxurious chocolates. 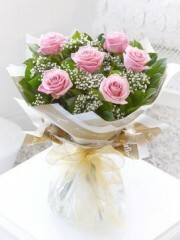 Stonehaven florist website lets you view our options at your leisure and easily browse our products. Our highly trained staff will put together a beautiful arrangement and ensure that its it carefully and beautifully presented with all the little details taken care of by our team at Stonehaven florists. We deliver same day, next day and also have te option for future delivery if you are organising delivery for a future event o specific date. 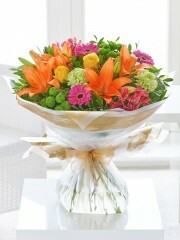 Flowers and plants are a great way to show someone you are thinking of them at a special time in their life.